Notes from Toy Fair 2011. I collect thumb toys. Few people know thumb toys by name, but most everybody has seen one. 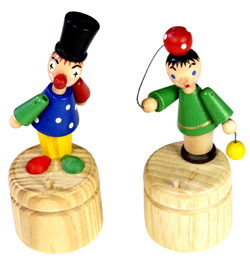 Thumb toys are those small figures that stand atop a little pedestal that fits in the palm of your hand. Push a button under the pedestal and tension is released from strings within the figure; it falls. Let go and the figure rights itself. I currently own 152 thumb toys. The breadth of the thumb toy world is impressive. The figures in my collection include robots, ghosts, elephants, turtles, dancing ants, circus strongmen, Curious George, a British cop, a bride and groom, a signing frog who swings on a cattail, Frankenstein, and the Fernsehturm television tower in Berlin.